La Plage is a unique apartment due to the stunning views it offers to La Zurriola Beach. It is located in Gros, the fashionable district of San Sebastian, known for its surfer atmosphere and cultural offer, such as the Jazz Festival and the Film Festival. One step away from the Kursaal Palace and only 5 minutes walk from the Old Town and the City Center. The apartment has been partially renovated with quality materials and equipment and has all kinds of amenities. The decoration has been taken care of in detail mixing styles, modern and classic. All rooms are exterior, very spacious and bright. It occupies the fifth floor of a building with elevator and offers the possibility of reserving a free parking space located in the same block. It offers three double bedrooms, a living-dining room, two bathrooms with large shower trays and a modern independent kitchen, equipped with quality appliances and complete kitchenware. The living room, has magnificent views of the beach of La Zurriola and highlights the large amount of light entering through its windows. Two of the bedrooms offer single beds of 105cm and 80cm. The other bedroom has a double bed of 140cm. 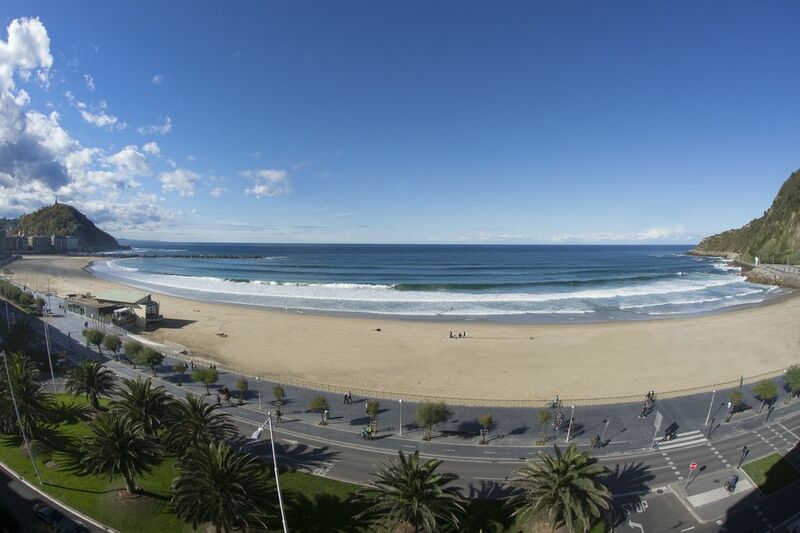 The apartment LA PLAGE, is located next to the HOLLYWOOD apartment, making it a very interesting option for groups of friends or large families traveling in San Sebastian. Both, apartments stand out for their location, spaciousness and exquisite decoration. They are perfect for an unforgettable vacation in San Sebastian. We are a San Sebastian-based agency specialized in short-term and medium-term holiday apartment rental since 2007. We offer a varied selection of apartments located in the best parts of the city and fully equipped. Thank you very much for staying with us and for your review!! Absolutely fabulous we would like to return! This unit has amazing 180° views from the fifth floor with a spectacular location that is easy to walk to the nearby sites. Everything is very well equipped Tastefully designed, very large and spacious. It was tremendous! Thanks for your feedback. Iberorent Apartments. Linda estadía, hermoso San Sebastián! Fue nuestra primera vez en San Sebastián. Realmente un lugar hermoso, para disfrutar. El apartamento muy bien ubicado con hermosas vistas a la playa. Muy cómodo y con todo lo necesario para estar a gusto. El edificio un tanto viejo y con falta de mantenimiento, especialmente el ascensor. El resto, todo muy bien. Hasta la próxima! Thanks very much for your review!! We are very glad to hear that. Thanks for all, hope to see you around soon. Iberorent Apartments. What a great location just in front of Lazuriola beach and fantastic view from the apartment. While it is comfortable for 4 people and I highly recommend a stay in this apartment, I believe they should provide a little more kitchen ware. Not enough coffee mugs or wine glasses...They should also leave a few essential in the kitchen. There was nothing. Not even salt. Thanks for your feedback. All our apartments are fully equipped. Besides, we offer bed and bath linen, basic welcome items, a cleaning kit and toilet paper in the bathrooms. For safety and hygiene requirements, will not find any basic foodstuff (salt, sugar, oil, etc.). Thanks Iberorent Apartments. El apartamento tiene unas vistas increíbles a la playa de la Zurriola. Excelente ubicación, muy limpio amplio y agradable y muy luminoso. Todas las estancias son exteriores y eso se agradece. Sin duda volveríamos a tomarlo !! !